Spring is here. In the Northwest, that means new produce is showing up in farmers markets and rhubarb is in season. A few of my clients have served this recently at dinner parties, so I thought it was a good recipe to share with you. The recipe can be easily double, tripled, or even quadrupled. If you prefer a thick oat topping (like I do), double the original topping recipe but just make one filling recipe. I look forward to your feedback after trying this delicious and easy dessert. Pulse flour, sugars, spices, and salt in a bowl of a food processor. Add butter and pulse 10 times about 4 seconds each. (If you do not own a food processor, you can work in the butter by hand or with a pastry knife.) The mixture will look lumpy. Add the oats and pulse about 4 times — one second each time. Chill the topping while you prepare the filling. Butter a 9 inch-by-9 inch baking casserole dish. 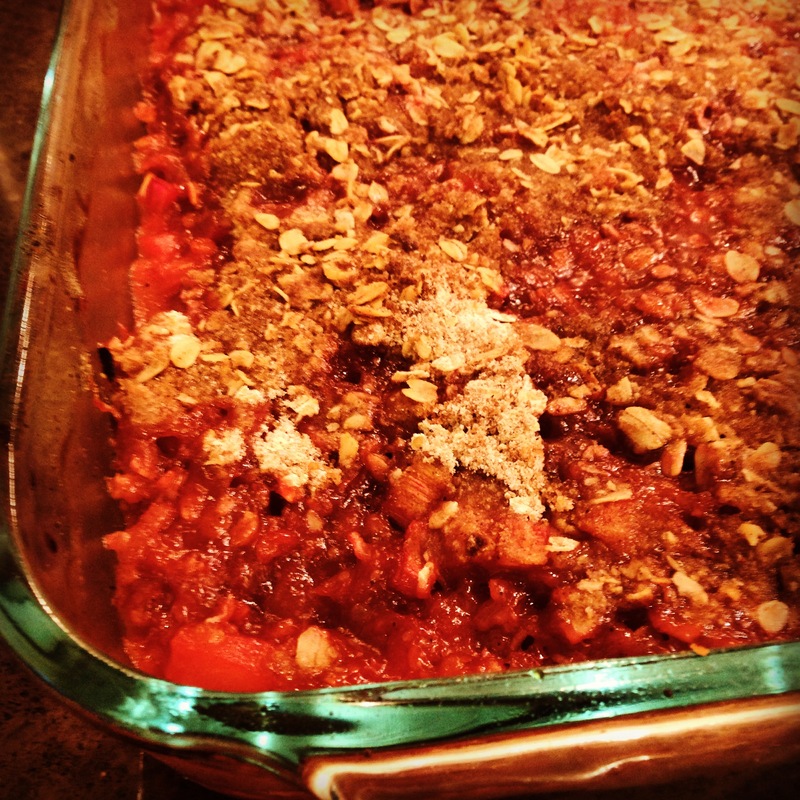 3 pounds rhubarb, cleaned and chopped into ½-inch widths across the grain. Mix together rhubarb, sugar, zest, and juice. Pour fruit into the buttered pan. Distribute topping evenly over it. Bake in a 425 degree oven for 40 minutes or until filling is bubbling and topping is golden. This entry was posted in Dessert, Desserts, Recipes and tagged Fruit, Gluten-free-optional. Bookmark the permalink.